With the help of members of the public and agencies, a 10.6 m long sperm whale was recovered by the museum when it was washed up off Jurong Island on 10 Jul 2015. The museum’s staff have been busy processing the carcass since then with the aim of finding out more about the whale and to mount an exhibition of The Singapore Whale to share our findings, and we need your help to make it happen! 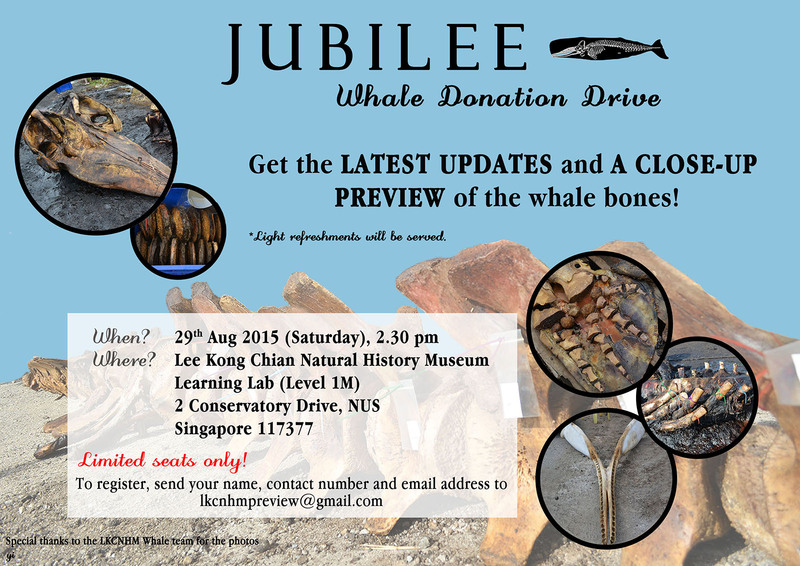 We are having a Donation Drive at the museum for the Jubilee Whale Fund next Saturday, 29 Aug 2015 at 2:30pm! You can hear about the latest updates and get a rare opportunity to get up close to the whale bones. To register, send us your name, contact number and email address to lkcnhmpreview@gmail.com. In conjunction with this Donation Drive, we are offering a promotion of 50% off all admission tickets (SISTIC charges still apply) to LKCNHM on the day! Tickets can be purchased at http://www.sistic.com.sg/events/lkc2015. If you are unable to attend the event, you can still contribute to the Jubilee Whale Fund online here.